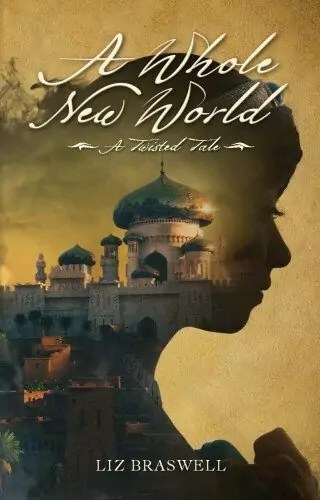 A Whole New World: A Twisted Tale, by Liz Braswell, is a re-telling of the Aladdin story that we know and love from the Disney film, but with a twist: it poses the question “What if Jafar had gotten the lamp originally instead of Aladdin?” Things would obviously be quite different, and this book explores that idea. To begin with, the first part of the novel is more or less a re-telling of the events from the movie. There is a prologue with a younger Aladdin where we meet his mother, which actually gives us a better background for him and who he is than the movie. 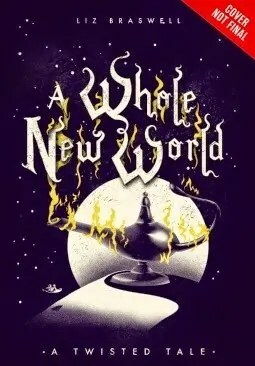 Then the first 1/4 or so of the book takes place from when Aladdin steals the bread in the marketplace, meets Jasmine in disguise, gets thrown into prison, visits the Cave of Wonders, and finds the lamp. All of this happens just like it does in the film. However, Jafar does get his hands on the lamp, so things change from there. I will say that this first part of the book doesn’t have a ton of suspense, since you know already what is going to happen from your knowledge of the movie. Nevertheless, I thought it went pretty quickly and it was interesting to get a glimpse inside the heads of the characters during some of the events. Particularly Jasmine – she had some thoughts to share about her realization that she doesn’t know about this poor side of Agrabah, and maybe her father isn’t the best leader after all. Not surprisingly, once Jafar has the lamp things get pretty bad in Agrabah pretty quickly. I will warm you that there are definitely some dark parts to this book, as well as some gruesome events described. There is violence and death, so if a younger reader is looking at this book and is particularly sensitive, that’s something to keep in mind. It also delves into themes that are not present in the movie. While they are somewhat political, they are also important topics to think about and I like the more thought-provoking nature of this book. Things like the fact that the original Sultan wasn’t a great leader because he didn’t pay attention to the people, that there is such segregation in the city that the rich had no idea what the poor were going through, and how to create a government that is fair to all of its citizens. Another event that occurs is when Jafar tries to get people to like him by literally making it rain gold – while people are excited at first, this inevitably leads to inflation and more issues. I found these concepts interesting to examine, especially from the perspective of a Disney story. I won’t say that the writing was the best I’ve ever read – it’s certainly not a masterpiece or a work of art, but for the most part it served its purpose as an enjoyable read. There were a few things that were written in a way that made me cringe, but overall I was fine with it. I think if you’re a Disney fan and you’re open to reading a different side of the story you love, then you will probably enjoy this. I know some people that don’t like to see their classic Disney stories touched, in which case stay far away from this one. For me it was interesting and a quick read. Are you interested in reading this? That sounds interesting. I’m not sure if it’s something I would want to read or read to my son, but I sometimes like when they retell a familiar story in a different way. Thanks for the great review. Yeah, I know some people don’t like it when their original stories are touched, but I think you have to go into it with an open mind. I like that sort of twisted fairy tale! I think I would love it. I need to get back into reading and off the computer more often. This would be something I could get into. Yes, I try to force myself off the computer and with a book for at least half an hour a day! I think it’s an important thing to do. I love revisionist tales, even if the writing isn’t that great. I’m going to add this to my To-Read list now! Oooo this sounds like a pretty interesting read! I must check it out! I will have to add this to my list, the revisionist idea makes me think if the book Wicked by Gregory McGuire. Loved that book. Interesting. I always like the Twisted Tales (Wicked, Confessions of an Ugly Stepsister) that Gregory Maguire writes, so this book intrigues me! I may need to check it out in September!